Oh, you lovely thing, you. I was enchanted by the delicate criss-crossing cables framing the simple v-neck. I was also hugely intimidated. Cables were still unfamiliar territory. And I loved this pattern so much that was afraid to try it and fail. To try it and ruin it. Three years later, I’m finally ready. I look at this pattern and I don’t see something lovely and unattainable. I see something super cute and not that difficult. That cabled section will be finicky, but most of this sweater is easy peasey: acres of reverse stockinette with a few bands of ribbing detail. No sweat. Finally knitting the Briar Rose tunic by Elisabeth Parker. Been wanting to knit this for three years. Sun Valley MCN worsted in Sangria colorway. I’ve even mustered the courage to modify the pattern to suit my body shape. Hip-length sweaters are not my friends. So I’ve shortened the distance between cast-on and waist shaping to something more suitable. And I’ve decided to go up a size to allow for the use of a worsted weight yarn instead of an Aran weight yarn. These changes may sound simple-Simon to all you veteran sweater knitters out there, but it’s a very big deal for me. I can’t help feeling a little proud. This represents enormous growth for me as a knitter. It seems fitting that it should all come together for me with this pattern. Previous Are Dental Hygienist Skills Transferable to Knitting? Awesome!! I’m about to cast on my first cardigan! Soo exciting! Lovely yarn, who makes it? It might take just the right pattern to lure you in. I’m trying to remember what my first sweater was (not counting the horrible llama thing I knitted for my ex). I didn’t know how to seam at the time and I didn’t think that was a problem. And the thing is, I’ve been knitting lots of cables and lace since then. So I don’t know what the hang-up was. Residual dread that took three years to drain away? Still unattainable to me – but I might look at a shawl pattern again that I bought (ages ago) and never dared to actually knit. Thanks!! It’s so funny. It doesn’t seem at all unattainable to me now. But it sure did three years ago. I think have some shawl patterns in my library like you’re talking about. 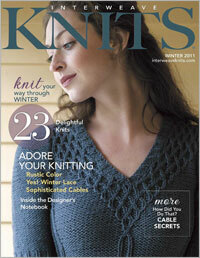 Maybe that would be a good knit-along theme: knit a shawl you used to think was too hard. Wooooo hoooo!! Go you 🙂 That’s super exciting! What a gorgeous sweater! I was going to say I didn’t think I’d ever seen it before…but it’s definitely already in my favorites on Rav. You can definitely handle it – cables aren’t any more difficult than all that lace you do! You should feel proud. It’s so exciting to grow as a knitter! Bravo. I can see how your love affair with this sweater started. Loving your choice of colour and look forward to seeing the finished article. I like the rosy color for a Briar Rose sweater. A lovely sweater and a big deal to me! Again you inspire. Thank you!